Art Omi International Artists Workshop had its initial summer residency eighteen years ago. Since then, its popularity has grown beyond the wildest dreams and expectations of its instigator, New York entrepreneur and art aficionado, Francis Greenburger. At this moment, more than thirty artists – chosen from literally hundreds of applicants – arrive in upstate New York from six continents representing a wide range of aesthetic interests and approaches. The duration of the workshop is three weeks wherein some extraordinary work is made and exhibited on the final Open Day. (This year that day will be July 18th). In addition to the vital presence of the Program Director, Claudia Cannizzaro, each year a critic in resident is elected by members of the Board as the aesthetic overseer of an impressive community of artists. This year’s choice was New York critic Sandra Skuvida, who in addition to her energetic optimism and inspired criticism is an important scholar of late modern and contemporary transglobal art. As one of the early board members of Art Omi, and its first critic in residence (1992), I was asked to participate this past weekend in a series of critiques with a selection of the new artist residents. Nisrine Boukhari is from Syria and is abstract figurative sculptor who works both with singular forms and within an installation context. Being an artist from the Middle East often involves political as well as aesthetic issues. Ms. Boukhari is working from a woman’s perspective on life in Syria as her three-dimensional figures make clear. There is an expressionist aspect to the work that is both intimate and universal. In her case, the two are not contradictory but exist as complements of one another. In either case, the expressionist force of these figures is undeniable. 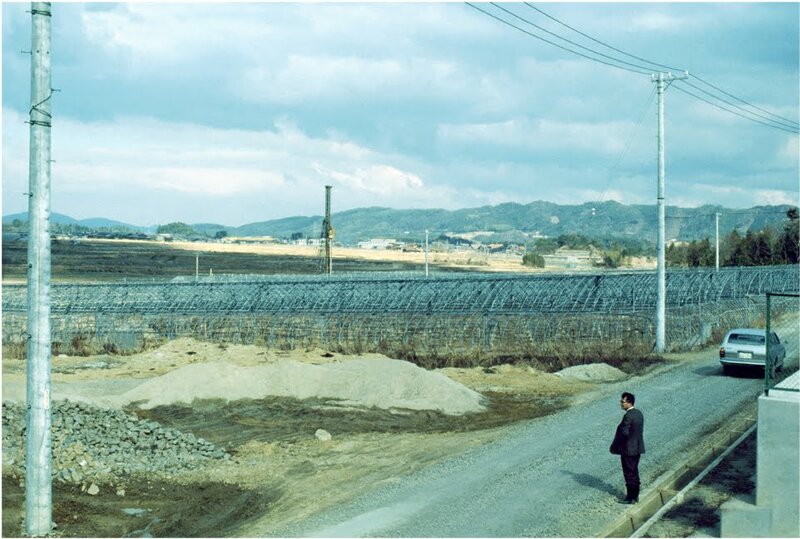 Jang Bo-yun is a South Korean artist who works with fictional narratives derived from older found photographs in which she researches people she never knew by going to the exact locations in which the photographs were taken. Ms. Jang’s specific interest is in memories she believes are instilled within these photographs. She will blow-up the original images and alter the correspondence between memory and reality as associated with the photographs. The question is in how Ms. Jang communicates her intention with viewers who encounter her work for the first time. While artists may often be concerned with details and specific points not visible in the work, viewers are more interested in grasping the general idea of the artist and then gradually working into the details once the initial direction of the work becomes clear. In addition I had lengthy and important discussions with Peruvian-born sculptor Ishmael Randall Weeks, who works with the material realities of the underclass based on recent experiences in Lima through a series of brilliantly constructed metaphorical vehicles; Chicago-born artist, Dread Scott, who investigates the significance and history of revolutionary movements from the outset of Modernism through the use of news images and provocative, often beautiful collages; and finally, the large drawings of Mongolian artist, Tuguldur Yondonjamts, whose enormous, actual-size shark with severed fins is transformed into a talisman of man’s tragic relationship to nature. There are other artists, of course, some further along than others, whose commitment is clearly there and, with a few exceptions, avoid conforming to the exterior signs of art market proliferation. In conclusion, one of the striking presences at Omi 2010 is the burgeoning large ink drawings of Takako Azami – focused, controlled, interior, and resonating with intense clarity and energy of mind. 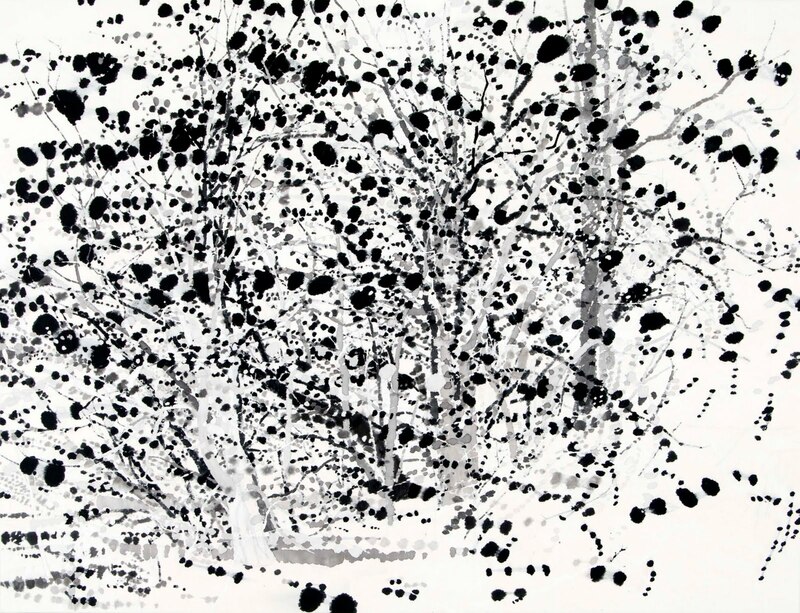 Takako Azami, Trees 0903, 2009. Ink, pigment on hemp paper, 45" x 59"
Robert C. Morgan was the first Critic in Residence at Art Omi,; and he is the first to write a blogpost! Thank you, Robert.